Albert Einstein, who knows a lot about powerful forces, is credited with recognizing that "The most powerful force in the Universe is compound interest." *Warren Buffett has a 23.5% compound annual return over 40 years. If you delay retirement investing for 10 years (start your retirement investing at 35 instead of 25), you reduce your investment return by 61.5% (based on a 10% annual return until age 65). If you reduce your return by 2% because of trading or mutual fund loads (getting 8% instead of 10%), over 30 years you reduce your return by 44.9%. 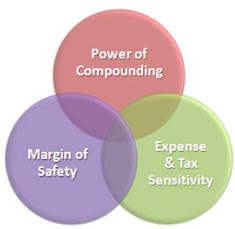 If you would like to see the impact of compounding on your investment portfolio, contact Visible Investment Advisors for a free consultation. …it's the money that ends up with the experience, and the experience that ends up with the money. If you have some money that you want to invest for your future retirement, children's education, or other important goal, you probably read the financial sections of newspapers, watch CNBC and other business news shows, and even watch the Wall Street gurus on Late Night Talk shows. These experienced market pundits all have incredible insight to the current market conditions - able to explain in great detail why the markets are acting the way they are. They all can point to their foresight with examples of stock selections or sector weighting that perfectly aligns with current market conditions, was a successful position they are just getting out of, or one that is poised to do well in the next 6 to 12 months. This experience makes it all seem so easy, so intuitive, so predictable. You wonder how you can hook your wagon to the success that this experience brings. In an attempt to leverage this experience, you buy the recommended stocks you hear about, subscribe to their newsletters, watch their TV shows, and buy their mutual funds. When you look back at the results of your actions, you see that there has been a transfer of wealth – your money transferring to them directly in the form of fees (your purchase of their newsletters and mutual funds), and indirectly from you pushing up the price of the positions they recommend or the advertising fees they earn. To see if your money is providing an experience or an appropriate return, contact Visible Investment Advisors for a free consultation. When you can afford to take risks. If you start early, save enough, and invest wisely, you 'll have the time to take the risk that lets you sleep at night and reach your investment objectives. If you start late, don't save enough, or invest inappropriately (taking to much or to little risk), you'll need to make greater sacrafices or take greater risks than you can tolerate, which can further hurt your chances of reaching your investment goals. * How much risk can you take based on the amount of time you have to invest? * How much risk are you able to take before you start losing sleep, or making investment decisions at the worst possible time? * How much risk do you need to take to reach your investment goals? It's only when these situations become visible that you can deal with them in an optimal manner. To see how much risk you can take, are able to take, and need to take, contact Visible Investment Advisors for a free consultation.